CTFishTalk.com: Harris Chain, Florida 01/29 - Connecticut Out of State Reports ( CT Out of State Reports ) - A Community Built for Connecticut Fisherman. 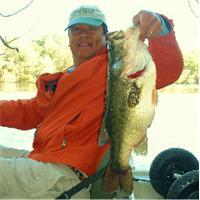 When I fished down in Florida, last January, I caught a six-pound largemouth bass. This year, I didn’t do as well, but I DID catch my first couple of largemouth bass for the year. I flew down from Hartford to Fort Myers on Sunday. My flight got diverted to Fort Lauderdale, due to a storm front that was moving across the state from west to east. After waiting for it to pass over Fort Myers, the plane took off from Fort Lauderdale and continued on to Fort Myers. I spent a couple of chilly days in Naples. I had arranged to meet Captain Mickey Maynard http://www.angelfire.com/home/lake/fishing/lake.html up on the Harris Chain, which is northwest of Orlando, at 6:00 am on Tuesday. We ended up fishing from 6:00 am to 6:00 pm. The air temperature rose dramatically during the day, from the high 30s to the mid-60s. Throughout the day, we saw a little sun, some clouds and even a sprinkling of rain, and enjoyed little to no wind. All in all, it was a beautiful, although mostly cool, Florida day. The water temperature, on the other hand, was downright cold. It slowly rose from 54 degrees to only 57 degrees. And the water was mostly murky over most of the lake. You’d retrieve a lure and not see it until it rose out of the murk into the one foot-deep layer of clear water next to the boat. The bite was non-existent to barely there at all. I might have had a couple of nibbles all morning. 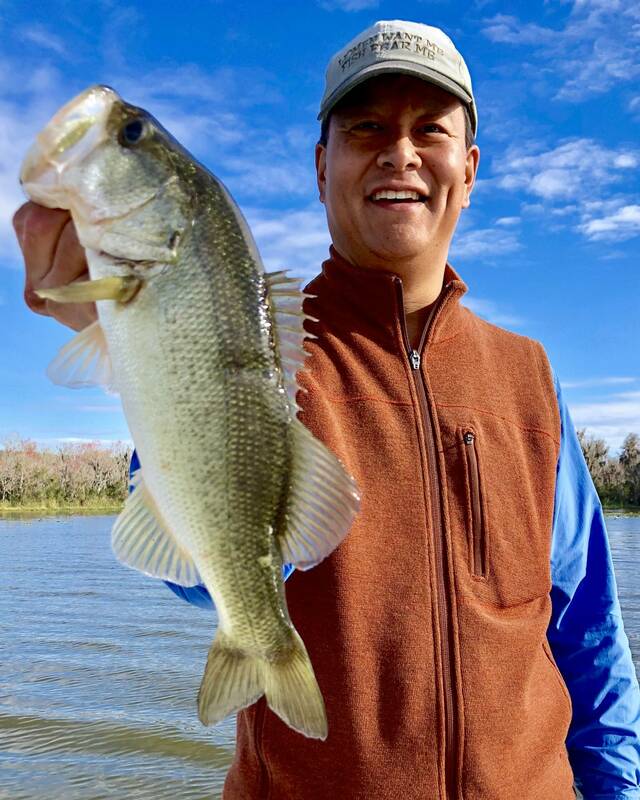 Captain Mick was a bad guide and got three bites; one fish we never saw, a three-plus pound largemouth bass that jumped and shook him off about eight feet from the boat, and a small keeper largemouth that Mick, rather dejectedly, tossed back overboard after he unhooked it. Whoo hoo! My first largemouth bass of the year! 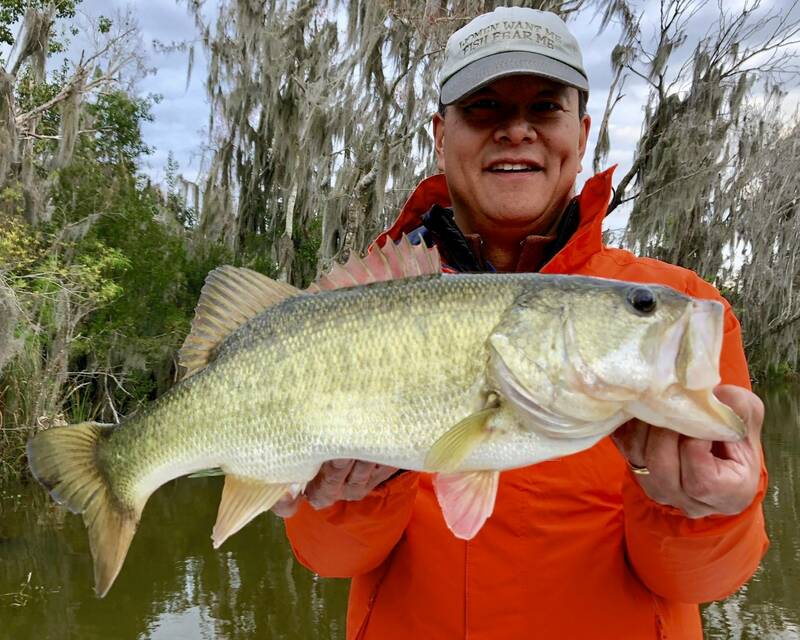 I’m really not sure that Captain Mick even has a working digital scale on his boat, so I can only guesstimate that the Florida strain largemouth was about 3-1/2 pounds, but it sure felt good to catch my first decent largemouth bass of the year. I know that Mick was more than a little frustrated by the slow bite that rolled in with Sunday’s cold front, but I really don’t have to catch a lot of fish or even any, really, to have a good time fishing. And I had a good time fishing! Even after I dropped my phone into the lake at the dock. Thanks, Mick! I’ll see you, again, soon, either down here or up on Lake Champlain.